Over 150 challenging hikes, easy nature treks, national parks, recreation areas, springs, pools, nature reserves, biblical and historical sites, battlefields, memorials and monuments. Numerous easy-to-read historical, geological and geographical narratives, along with biblical stories and descriptions of the region’s flora and fauna. 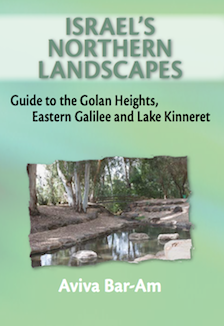 All kinds of information about the Golan Heights, the sources of the Jordan River, the Huleh Valley, the Finger of the Galilee, the Sea of Galilee (Lake Kinneret) and Mount Hermon. Countless legends, anecdotes, and stories. One hundred and twenty stunning photographs. Five full color regional maps. My husband, nine year old daughter and I have just returned from another fabulous journey to Israel, with Shmuel and Aviva, for the second year in a row, as our tour guide and travel planner! This .We had a perfectly planned itinerary, well suited to the needs and interests of the three of us. Traveling around Israel with Shmuel as our guide is really the ideal way to tour. He is energetic, enthusiastic and he knows every inch of the country and therefore navigates the country with complete ease. He is extremely knowledgeable about all the sites, the history, the geography, the culture, etc. Shmuel has become a part of our family! We can’t wait to see you again!